1. Blow your balloon up to the size you would like your bowl to be and tie. 2. Take a few sheets of kitchen roll and cut each sheet into small pieces. 3. Put a small layer of the First Edition Deco Mache glue onto your balloon, only covering the size you require your bowl to be. 4. Begin layering your kitchen roll, ensuring to add 3 or 4 layers and sealing it with the First Edition Deco Mache glue. Leave to dry. 5. Cut your Simply Creative Decoupage papers down to small pieces and layer them on top of your kitchen roll on your balloon. Make sure you cover the whole section of kitchen roll with a few layers for strength. Allow to dry over night. 6. Pop the balloon and remove it from the bowl. 7. Cover the inside of the bowl with coordinating sheets of paper, ensuring to add a few layers. Allow to dry. 8. When the bowl is dry, you can trim the edge to get a neater finish. Cover the bowl with a layer of the Deco Mache glue to add a shiny finish. Allow to dry and it’s now ready to fill! If you’d like a more detailed design, why not layer a selection of pretty embellishments on the outside? 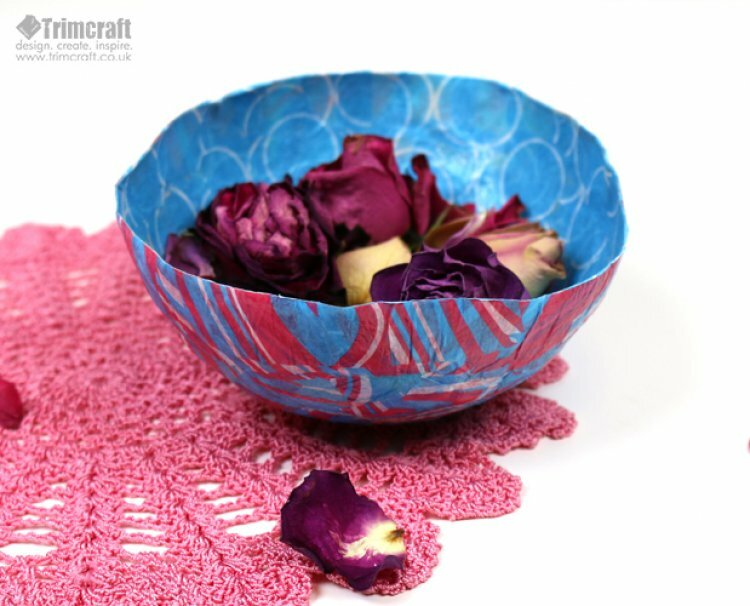 You could make different sized bowls using a range of Simply Creative Decoupage designs! If you’d like some tips on how to decoupage effectively, watch Marketing manager Claire create her own project here. Remember to upload your stunning makes to the project gallery and to #Trimcraft on Social media!